Shepherd’s and their dogs enjoyed the first in a series of three winter dog trials at Springfield Farm, Kildonan at the start of the month. 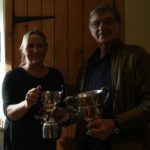 In the nursery category judge Wully Stevenson judged eight dogs with the points in the various categories as follows; Nursery 1, 1 N McMaster with Gail, 67pts, 2 G Brookes with Rob, 54pts; Nursery 2, 1 G Brookes with Rob, 81pts, 2 N McMaster with Gail, 64pts; Sweepstake, 1 I McConnell with Drift, 80pts. The next trial will take place at Birchburn, Shiskine on Saturday January 26 at 11am.